Then it’s time to try Swagbucks! 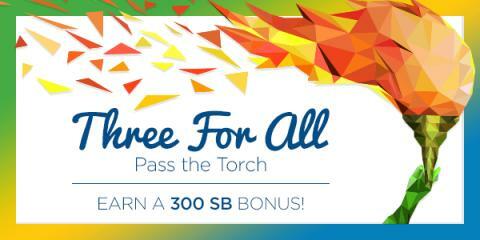 In celebration of the Summer Games, Swagbucks has announced an another promotion where you can get a $3 (300 SB) Bonus just for signing up through our site and earning your first 300 SB before September. So open up your umbrella (not in the house!) and put on your slicker and galoshes because it’s about to pour 300 SB Bonuses for you and your family and friends. Take a 5 minute survey for 60 SB and a 13 minute survey for 100 SB. Even if you get DQ’d, you get paid up to five times for a total of 5 SB. Click through entertainment-focused web content with NCrave for 20 minutes and earn 20 SB. Install the Hulu App on your phone and earn 24 SB. That’s it! You’ve just earned 300 SB (worth $3 on its own) and you’ll get a $3 Bonus for your effort! That’s it! (the 300 SB bonuses will credit by September 6th) So once again, starting today, send out those referrals, a 300 SB Bonus could come in handy for a rainy day! I love Swagbucks. I just spent all of my Amazon gift cards (the majority from Swagbucks) on a new mattress. Now, it's time to start saving for the holidays.